During an interaction, a customer service representative completes a number of service requests (cases) or other actions to resolve customer issues. You can configure Pega Customer Service to automatically determine the reason for an interaction and presents that value during the interaction wrap-up. Any other service cases, Express Actions, or Express History options that run or are selected during an interaction are also displayed in the Reason for interaction list, allowing the CSR to select another interaction reason if necessary. A map value rule allows you to configure how the Reason for interaction value is set during the wrap-up. Click Records > Decision > Map Value. 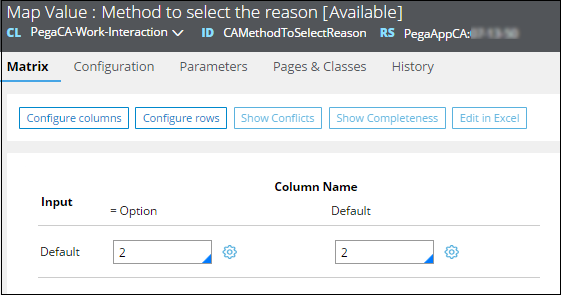 Select the PegaCA-Work-Interaction.CAMethodToSelectReason instance and save it to your ruleset. Add, modify, or delete the Default values. The possible values are 1, 2, or 3. 1 = First interaction event. 2 = First work object created; if no work object is created, the first interaction event is used. 3 = Longest interaction event.